Performing these rituals, known as the Hajj, is the fifth pillar of Islam and the most significant manifestation of Islamic faith and unity. Undertaking the Hajj at least once is a duty for Muslims who are physically and financially able to make the journey to Makkah. The emphasis on financial ability is meant to ensure that a Muslim takes care of his family first. The requirement that a Muslim be healthy and physically capable of undertaking the pilgrimage is intended to exempt those who cannot endure the rigors of extended travel. The pilgrimage is the religious high point of a Muslim’s life and an event that every Muslim dreams of undertaking. Umrah, the lesser pilgrimage, can be undertaken at any time of the year; Hajj, however, is performed during a five-day period from the ninth through the thirteenth of Dhu Al-Hijjah, the twelfth month of the Muslim lunar calendar. The circumstances of the Hajj began to improve during the time of King Abdul Aziz Ibn Abdul Rahman Al-Saud, the founder of the modern Kingdom of Saudi Arabia. Major programs were introduced to ensure the security and safety of the pilgrims, as well as their well-being and comfort. Steps were also taken to establish facilities and services aimed at improving housing, health care, sanitation and transportation. Today, though the rituals at the holy sites in and near Makkah have remained unchanged from the time of the Prophet, the setting for the pilgrimage and the facilities available to the pilgrims are a far cry from those that existed at any time in history. Hardship was once expected and endured as part of the pilgrimage, and Muslims who embarked on this undertaking traditionally assigned a relative or trusted member of the community as the executor of their wills in case they did not return from the journey. Muslims today undertake the pilgrimage in ease, receive a warm welcome on their arrival in Saudi Arabia, and are provided with the most modern facilities and efficient services possible. Without the distractions that their forebears had to contend with, today’s pilgrims are free to focus solely on the spiritual aspect of the Hajj. “It is truly amazing,” said Rajeeb Razul, a journalist from the Philippines, as he stood on the roof of the Ministry of Information building near the Nimera Mosque in Arafat watching a column of pilgrims that stretched to Mina almost eight miles in the distance make their way past the mosque toward the Mount of Mercy. “To organize a gathering of humans this large, for housing them, for feeding them and for meeting their every need year after year must be a monumental task,” he observed. Saudi Arabia considers serving the guests of God an honor, and dedicates vast manpower and financial resources to the proper conduct of the pilgrimage. Over the past four decades, it has spent billions of dollars to expand the Holy Mosque in Makkah and the Prophet’s Mosque in Madinah, as well as establishing modern airports, seaports, roads, lodging, and other amenities and services for the pilgrims. The establishment of these facilities by itself does not ensure a successful Hajj. To do so, the Kingdom has put into place a vast organization supervised by the Supreme Hajj Committee, which reports to the Custodian of the Two Holy Mosques King Fahd Ibn Abdul Aziz, who traditionally is in Makkah during the pilgrimage. The committee seeks to coordinate the activities of various government ministries and agencies and prevent redundancy. Each of these organizations assumes responsibility for projects in its sphere of expertise. For example, the Ministry of Islamic Affairs, Endowments, Call and Guidance issues special booklets on the rites of the Hajj in many languages for distribution among the pilgrims. The Ministry of Health oversees medical services while the Ministry of Information hosts journalists and members of the media from other countries to cover the pilgrimage, while at the same time arranging for live transmissions of the rituals by satellite throughout the world. Planning for each year’s pilgrimage generally starts at the conclusion of the previous one and involves evaluating various programs and, if necessary, introducing steps to improve any service that is deemed below par. Once plans for the next Hajj are approved, they are sent to the appropriate government agency, which immediately sets out to implement them. The progress of these plans is reviewed by the committee throughout the year and, once in place, the project is inspected several weeks before the pilgrimage starts. Performing the Hajj is the spiritual apex of a Muslim’s life, one that provides a clear understanding of his relationship with God and his place on Earth. It imparts in a Muslim not only the assurance that he has performed the fifth pillar of Islam by following in the footsteps of the Prophet, but also the realization that he is part of an ummah (nation) that is more than one billion strong and spreads across the globe. This feeling is brought home upon the pilgrim’s arrival in the Kingdom. Most pilgrims arrive by air, and as their planes taxi toward the impressive Hajj Terminal in Jeddah, they pass jetliners with familiar names, but also ones that bear exotic markings such as “Southern China Airlines” and “Daghestan Airlines” and others from every part of the world. While waiting to be processed through the arrival hall, the pilgrim begins to shed his identity as he stands amidst a sea of people in Ihram, the two seamless pieces of white cotton that men wear and the simple, generally white, attire that women wear. Here no one can tell a person’s social or economic status, or his national origin based on the clothes he wears. Suddenly the pilgrim is simply, and above all else, a Muslim, and the realization slowly sets in that he is now focusing more than ever on other people’s faces rather than their clothes. These faces represent almost every race or nationality on Earth. As energetic young Saudis move the pilgrims rapidly through customs, he notices Arabs, Indians, Bosnians, Chinese, Spaniards, Africans, Laotians, French, Americans and many others. Contact with people from such diverse races and nationalities over the days and weeks spent in the Kingdom engenders in the pilgrims a sense of understanding of and trust in total strangers simply because they are performing the Hajj together. Before heading toward Makkah, the pilgrims are already dressed in Ihram or may change at Miqat, where special facilities are set up for this purpose. By donning the Ihram, the pilgrim enters a state of spirituality and purity. On the way from Jeddah to Makkah along the modern superhighway, pilgrims board one of the fleet of 15,000 buses assigned to the Hajj. This vast concourse of vehicles approaches Mina, some four miles to the northwest of Makkah, where most of the pilgrims are housed in the thousands of air-conditioned tents that stretch to the limits of Mina Valley. Walking through this vast city that has been established for use for only a few days a year, the pilgrim is struck by the orderliness of the place. Food is prepared in hundreds of kitchens spread throughout Mina and distributed among the tents. Thousands of drinking fountains and wash areas are located throughout the tent city. There are hundreds of medical clinics that supplement the hospitals in Makkah and Arafat. Security personnel and traffic police guide and help pilgrims. Despite the clear signs and numbered rows, some pilgrims, particularly the elderly, tend to get lost and need assistance finding their tents or groups. Banks of telephones are located in all the pilgrimage sites, allowing pilgrims to make direct international calls. After sunrise on the ninth of the Islamic month of Dhu Al-Hajjah, this vast crowd of nearly two million begins to walk some eight miles to the Plain of Arafat, passing Muzdalifah on the way. Many perform the noon and afternoon prayers at the Nimerah Mosque, a tradition set by the Prophet. Approaching Arafat by midmorning, the pilgrim is amazed to find the vast plain covered by what appears to be a thick fog, even though the temperature hovers around 90 degrees Fahrenheit. This optical illusion is created by thousands of sprinklers placed atop 30-foot poles and spaced some 50 feet apart, which spread a fine mist of water to provide coolness. Millions of containers of chilled water are distributed from refrigerated trucks located along the pilgrim route. Despite these precautions, the wail of sirens is ever present as hundreds of ambulances pick up pilgrims suffering from heat exhaustion and transport them to special clinics for treatment. The more serious cases are evacuated by helicopter to hospitals. Pilgrims are required to spend the day in the plain, performing what is called the Standing at Arafat. Here they also visit the Mount of Mercy and ask for God’s forgiveness for any sins committed and for blessings. Facilities have also been set up here to feed the pilgrims and meet any requirement they may have. After the sun has set this river of humanity retraces its steps back toward Makkah, but stops at Muzdalifah until the brightness of day appears on the eastern horizon. Here the pilgrims collect seven pebbles and carry them to Mina. As they arrive in the valley, they trek along a two-level pedestrian walkway some 100-yards wide toward the three stone pillars called the Jamarat, which are meant to represent Satan. The pilgrims are required to cast the pebbles they have collected at the Stone Pillar of Aqabah while praising God, in a symbolic rejection of Satan. As the pilgrims approach along the walkway, they join those already at the pillar and, after hurling their pebbles circle toward the exit ramp in the direction of Makkah. Signs in various major languages direct the crowds along the route. The pilgrims then walk some four miles along pedestrian walkways to reach Makkah, where they perform the tawaf, circling the Ka’abah in the Holy Mosque seven times counter clockwise. They then perform sa’ay, the running between Safa and Marwa in an enclosed, air-conditioned structure. Male pilgrims are then required to shave their heads, although cutting a lock of hair is acceptable for both men and women. At this point the pilgrims sacrifice an animal, donating its meat to the needy. Each year, over 600,000 animals are sacrificed, in modern abattoirs that complete the processing of the meat over the three days of the Eid. Distribution of this sacrificial meat goes to those in need in some 30 countries. The rites of the pilgrimage are now completed. Pilgrims come out of Ihram and wear their normal clothes, but remain at Mina for the Eid Al-Adha, the festival that signals the culmination of the Hajj. Over the next two days, they stone the three pillars in the Jamarat, before performing the Tawaf Al-Wida’, the Farewell Circumambulation of the Ka’abah before their departure from the city. While not required as part of the Hajj, most pilgrims visit the Prophet’s Mosque in Madinah during their visit to the Kingdom. 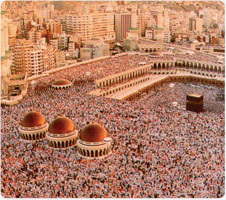 Throughout the Hajj, the largest annual gathering of people on Earth, the pilgrimage is marked by a total absence of any disagreements or altercations among the pilgrims. Courtesy and helping others are the norm. Peace, serenity and piety pervade the entire pilgrimage and the pilgrims. At the conclusion of the Hajj, the pilgrim has a profound feeling of having gone through a life-transforming spiritual experience. He comes away with pride in having successfully performed a ritual dedicated to God and in belonging to a huge family of people that shares the same religious beliefs. And he has acquired a sense of humility, inner calm, brotherhood and strength that lasts a lifetime.